Sitting on two harbours, Scenic Cruises in Auckland are unmissable. Take your time sailing around the Hauraki Gulf, or under the Harbour Bridge. Learn about Auckland's history and culture as your guide points out the sights. True relaxation. Auckland Scenic Cruises are easily found in and around the harbour area. 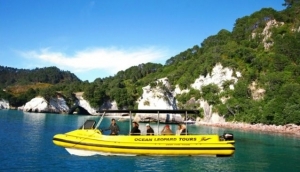 You can jump aboard a scheduled cruise around the harbour, and maybe over to Waiheke Island and Devonport. It's a great way of seeing the sights and you can also use a quick, hour long cruise to pick out places on the mainland you want to visit later. As a way of getting to know Auckland, there isn't anything more relaxing than sitting on a yacht of cruiser, and watching the world go past you. Many cruisers have licensed bars, plus commentary from knowledgeable guides. For something more comprehensive, book onto a half or full day cruise, out to somewhere like Rangitoto Island or Great Barrier Island. You can find themed eco-cruises, nature cruises, beach cruises and history cruises. So, whatever literally floats your boat, there's plenty to see out on the calm, clear waters around Auckland.